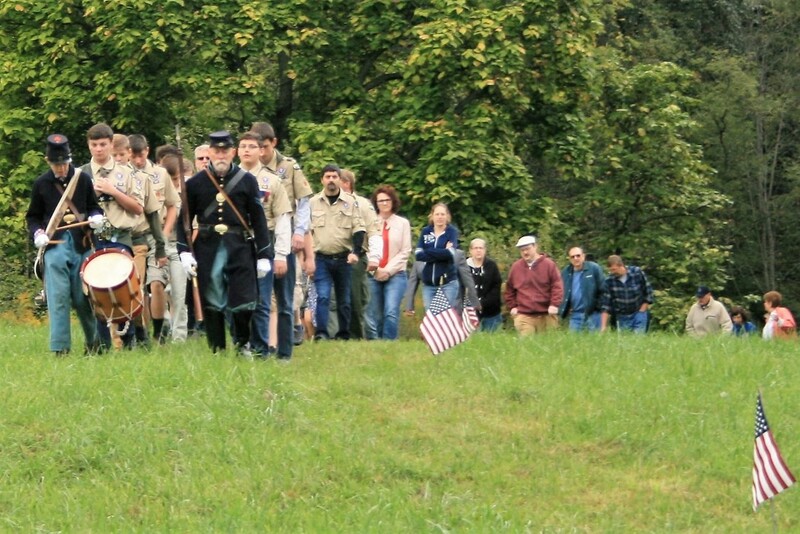 On Saturday, 30 September, 148th reenactors Preston Putillion and John Streno led over one hundred community members to dedicate the recently restored Mount Zion Cemetery located between Tyrone and Tipton, Pennsylvania. Bob Dollar, U.S. Air Force veteran and Vice President of the Tyron Area Historical Society led restoration of the cemetery, including honoring the graves of three Civil War Veterans. ​The use of intelligence during the Civil War is the subject of the book chapter, “Guide to Civil War Intelligence” in AFIO’s recently published book, Guide to the Study of Intelligence. The interview “IST lecturer lends Civil War expertise to new intelligence guide” discusses both the Civil War chapter, as well as the author. The impressive 800-page book is a project of AFIO's Academic Exchange Program (AEP), includes more than 65 articles on all aspects of intelligence, and is edited by Peter C. Oleson. Free for academic use, instructors can become familiar with intelligence-related subjects. Guide articles, written by both academic experts and seasoned practitioners introduce subjects, and include recommended readings for further study. 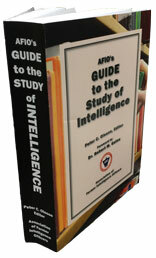 Afio’s Guide To The Study Of Intelligence is available on the Washington Times web. Miles-Humes Historical House museum volunteer, and family friend, Joyce Adgate and I are shown here displaying a recently restored 1891 Grand Army of the Republic (G.A.R.) “Personal War Sketches” book by Bellefonte, Pennsylvania’s old G.A.R. Gregg Post No. 95. 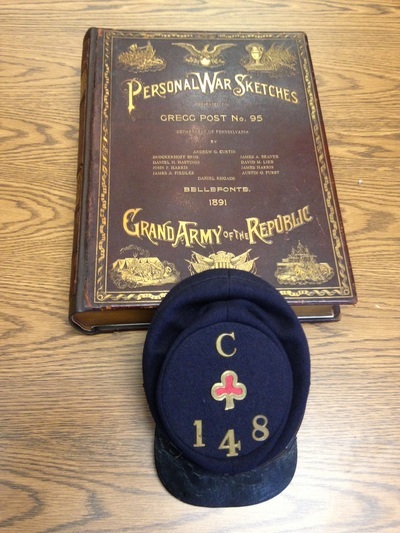 The book contains many interesting Civil War soldier bios, including one for 148th P.V.I.’s Colonel James Beaver, as well as other members of that Regiment. 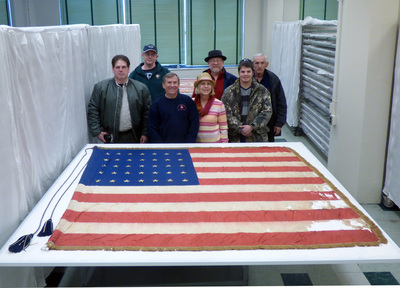 Members of the Colonel James E. Crowther Camp #89 Sons of Union Veterans donated time and money to have the book repaired at Wert Bookbinding in Grantville, PA. 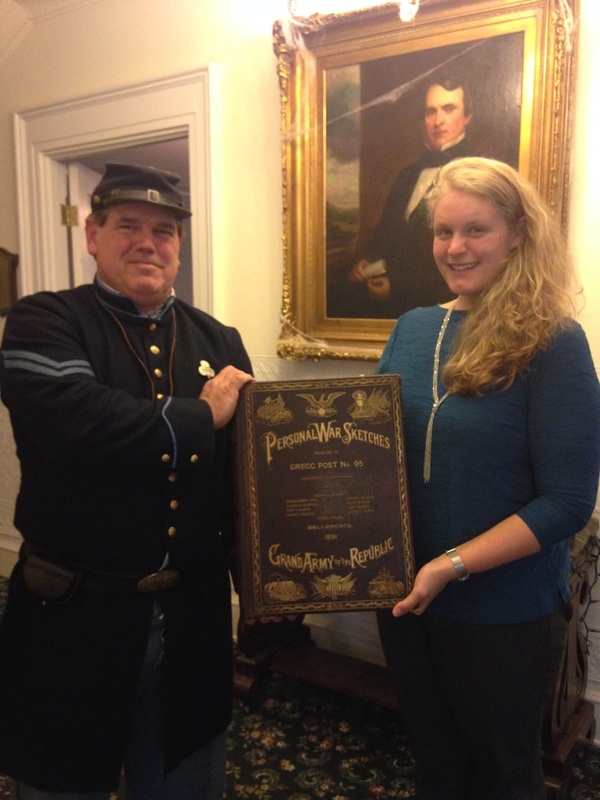 The book is now on display at the Miles-Hume Historical House in Bellefonte, PA. All are encouraged to visit the museum’s PA History Room to enjoy this and other beautiful pieces of our local history! The fourth annual " Battle for Greenwood Furnace " held Saturday, August 20 and Sunday, August 21, 2016, was very enjoyable for all attendees. Once again, Ralph Lincoln (photo above) provided memorable speeches in his portrayal of President Abraham Lincoln. The Confederate Units of the 5th Texas and 13th Virginia once again outnumbered the Union soldiers of the 148th Pennsylvania Volunteer Infantry (PVI) Company C and 125th PVI. 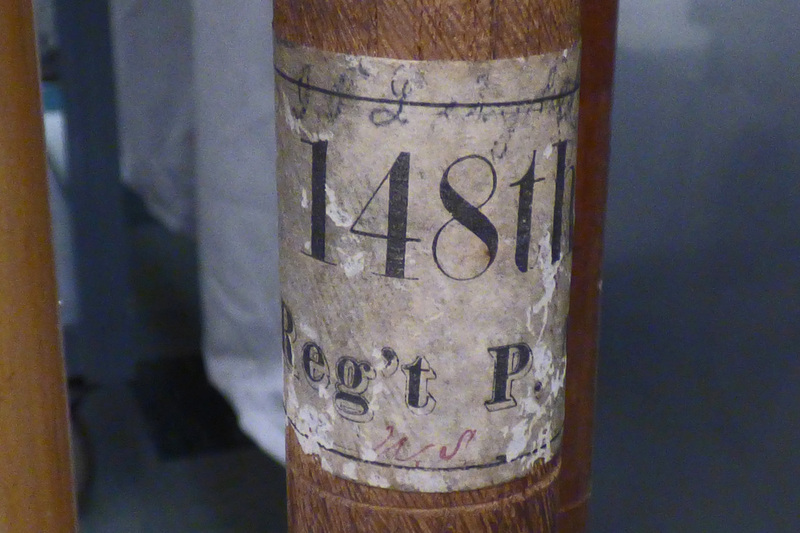 The Union soldiers, however, had at their disposal the 148th PVI Field Hospital! Battle Re-enactments were performed both days, despite rain on Sunday. The "Sons of the Union Civil War Veterans of the Col. Crowther Camp # 89" were also in attendance, and did an excellent job in several public presentations of living history! Attached are the schedules of events Saturday and Sunday this year at Greenwood Furnace. The schedule is similar to last year, with a few surprises! 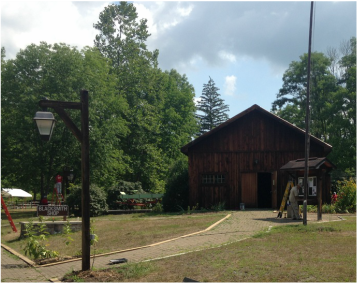 SCI Huntingdon volunteers did an excellent job fixing up the area around the Blacksmith Shop, as shown in the image. The building is now sealed, and tripping hazards are reduced. We look forward to seeing you the weekend of August 20-21, 2016. Be ready for an awesome time! Greetings to you all! I hope this e-mail finds you all doing well, and enjoying our love of history! With the Greenwood Furnace Civil War Event less than a month away, I wanted to start sending you e-mails to update you on the preparation. Huntingdon SCI inmates installed new 6 x 6 timbers on the sides of our block sidewalk to reduce a safety hazard, as well as stained and sealed the blacksmith shop. Under the leadership of the guard Ken, they have done an excellent job! We are hoping to get some rain before the event as it is getting very dry here. As we have done every year, there will be a port-a-potty available for the Confederates to use, close to their camp. 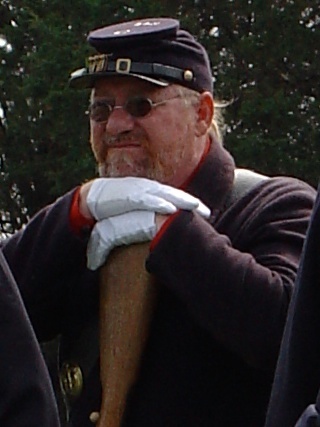 We hope to have more Confederates this year, and look forward to having Union Bucktails attend! 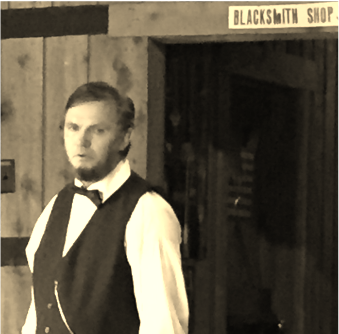 Ralph Lincoln will also be here portraying Abraham Lincoln! Showers at our facility are free for all reenactors, along with ice. The lake is warmer than usual from the lack of spring water flowing into it, so you may also enjoy some beach time if desired. The grounds will be mowed and trimmed, and ready for you to enjoy, assuming we get some rain to make things grow. We are finalizing the schedule of events, and will post here when complete. Please let me know if you would like to do a presentation, and we will add you to the schedule. Feel free to email or call with any questions! 148th reenactors Julianne and Lynn Herman gave a program to the Civil War Round Table, Tuesday, July 5, titled "The Civil War in the Far, Far West." It is interesting when technology preserves seemingly distant historical events for future generations. 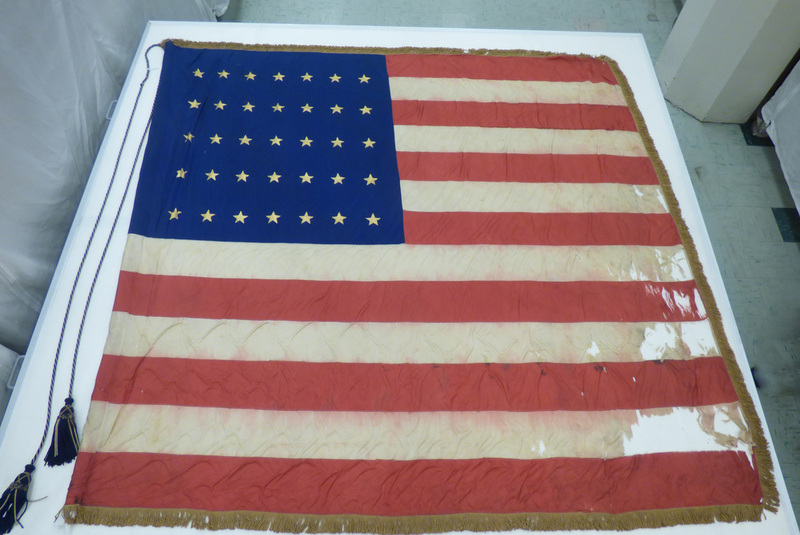 For example, in 2014 we shared a 1930’s Smithsonian recording of the Rebel Yell performed by veterans. Now we are able to share a video clip of Mr. Samuel J. Seymour, the last living eyewitness to the assassination of President Abraham Lincoln at Ford's Theater in Washington, D.C.
Mr. Seymour was the mystery guest on the February 8, 1956 episode of the “I've Got a Secret” game show. Mr. Seymour (March 28, 1860 – April 12, 1956) was 95 at the time of his appearance. In addition, YouTube poster HistoryFlicks4U also shared a link to the referenced article, "I Saw Lincoln Shot" by Mr. Seymour. ​Members of the 148th visited Harrisburg March 19, 2016 to tour the Civil War Flag Museum, along with the 148th National and Regimental Flags, Flagstaffs, and Camp Curtin. 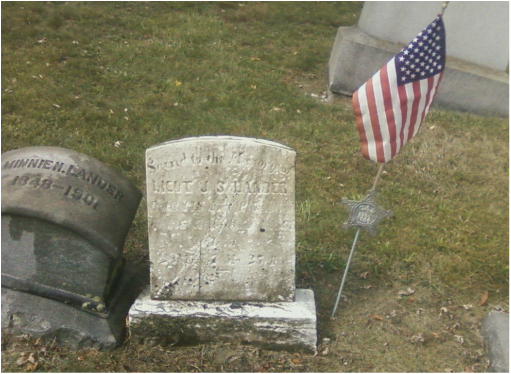 There are Civil War historical markers ,and a statue of Governor Andrew Gregg Curtin at the site.